A necessity for the serious chef, the Elite Chef Black Ceramic Knife Set includes 3 ultra-sharp 100% ceramic knives that slice through fruits, vegetables, and boneless meats with unmatched ease. Coupled to perfectly balanced ergonomic handles, the Elite Chef Ceramic Knives render a wide variety of cutting tasks effortless, from chopping, to mincing, slicing and dicing. These distinctively shaped knives utilize the purest ceramic, with each blade close in hardness to diamonds and able to preserve its razor-sharpness 10 times longer than traditional steel blades. 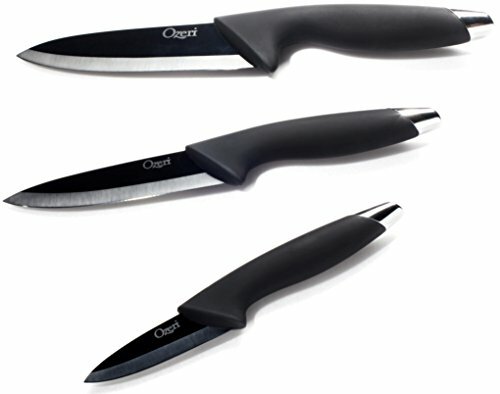 Unlike metal knives, the Ozeri Elite Chef Black Ceramic Knives do not corrode, rust or leach metal ions into food. They are impervious to moisture, oils and acids in common foods, and preserve their freshness despite long-term exposure to such foods. Finished with a reflective black veneer, each Ozeri ceramic knife weighs less than half of an equivalent metal knife, thereby reducing fatigue and pain associating with preparing big meals and repetitive cutting. Your satisfaction is 100% guaranteed. The Elite Chef Black Ceramic Knife Set includes 3 ultra-sharp 100% ceramic knives that slice through fruits, vegetables, and boneless meats with ease. Coupled to perfectly balanced ergonomic handles, the Elite Chef Ceramic Knives make chopping, mincing and dicing easier than ever before. By utilizing the purest ceramic, each blade is close in hardness to diamonds and preserves its razor-sharpness 10 times longer than steel blades. Unlike metal knives, the Elite Chef Knives do not corrode, rust or leach metal ions from extended exposure to moisture, oils or acids in common foods. Each Ozeri knife weighs less than half of an equivalent metal knife, thereby reducing fatigue and pain from repetitive cutting and meal preparation. If you have any questions about this product by Ozeri, contact us by completing and submitting the form below. If you are looking for a specif part number, please include it with your message.